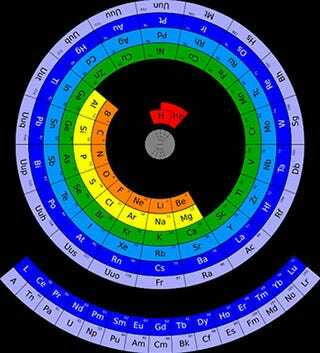 Researcher Mohd Abubakr says that his circular periodic table is better than Mendeleev's. I'd have given him the Nobel in chemistry—if Obama hadn't got it first for mixing himself a whiskey with Red Bull onboard Air Force One. Abubakr—who works at Microsoft Research in Hyderabad—says that if you arrange the table in circular form it gives you an idea of the size of the atoms. The closer to the center, the smaller the atom element would be. That's why hydrogen and helium—with less atomic weight—are the nearest to its center. His table also preserves the periods and groups, and manages to look neat and pretty at the same time. The Physics arXiv Blog at MIT's Technology Review disagrees. They said that the table is flawed because it can only be read by rotating it—which doesn't make much sense, since you can easily rotate an image on the screen. Their other criticism is valid, however: They say that the genius of Mendeleev's table is that it can "predict the properties of undiscovered elements," arguing that Abubakr's table is not as intuitive.